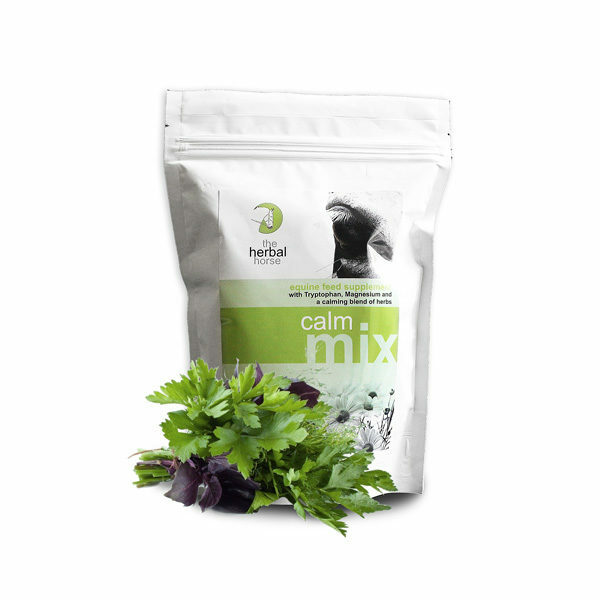 A natural calmer for horses with a blend of herbs, Tryptophan, vitamins and magnesium. It’s formulated to have a calming effect without causing drowsiness. Available in the UK and Ireland. I had previously used other calmers (in particular NAF Magic and was using this prior to trying Calm Mix) but this was having no effect on either of my horses. In particular my ISH with a bubbly infectious personality that nearly all of the time is wonderful. However, he has the ability to see imaginary monsters, shadows, BIG leaves, and any bird of any description flapping was just all too much and he would either do an over exaggerated leap and shoot off or stop dead and try and run off. None of this was too terrible but it was just annoying and frustrating especially when schooling. He also had no patience – he wouldn’t wait at road junctions, wouldn’t wait for cars to pass etc – I think he had previously got away with a lot just because he is a cheeky loveable chap. On Kerry’s review on E-venting on Calm Mix I thought I would give it a whirl. Within the first dose there was an immediate difference. The leaps were smaller, the monsters weren’t frightening and he would wait at a junction out hacking. Over the next couple of days I tried out giving half the amount and none. The effects are immediate and when he had none in his breakfast he was a little monkey again. And it sounds obvious, half the amount had half the effect! It’s palatable, excellent value for money and I certainly won’t be using anything else now. I rode this morning in a howling gale and in an absolute downpour and he paid no attention to the typhoon and schooled beautifully – I can’t ask for more than that. There will be no need for expensive pastes at competitions either! He is a fairly large chap at 16.2 and irish and I have found that 3/4 measure in both his morning and night feed is the perfect amount. He is still his awesome self, not at all drowsy just without his plonker moments! Happy days ? I’ve been using it for about 6 weeks now. My mare is still a bit quirky but there is a definite difference in her day to day. She is more rideable more often, her concentration is improving and she is less bolshy. As I say we do still have issues but we work through them quicker. I started on 4 scoops and next week I’m dropping to 3 for a couple of weeks as an experiment! I have also recommended it to someone at our last outing who was “struggling” and had tried “everything on the market bar sedalin”!!!! Happy to chat about my experiences if you like…. I used this on my ex race horse Kilbride star who had been off the track less than a week when he came to me. Had never hacked out alone or travelled alone. I got in touch with beryl and started using it, saw results within a couple of weeks and started taking him out alone to friends to ride and low level comps just to get his confidence (and mine) back. He’s no longer on it and has gone to a forever home in Bridlington to hunt…. I don’t think I could ever have managed to start his re education without it to be honest as nothing else worked on him at all!!! Thanks beryl and your team! !